In case you missed the announcement, Book 33 of the Klepto Cat Mystery series has been published. You can order the print copy of The Secret Claws here: https://www.amazon.com/Secret-Claws-Klepto-Mystery-Mysteries/dp/0998036722/ref=sr_1_40?s=books&ie=UTF8&qid=1549110980&sr=1-40&keywords=klepto+cat+mysteries Or just type in the title or my name at the Amazon prompt. The kindle version is still under construction. When will it be ready? As soon as the busy formatting person can complete it. Watch for the announcement here and at my Klepto Cat Mysteries facebook page. Rags is large and in charge in this story. He invites himself on a family getaway, and while he causes enough trouble to keep his humans on their toes, he also (nearly) single-pawedly prevents a disaster and makes sure the show goes on. You’ll chuckle and you might nibble on your fingernails while following this story to its surprising climax. 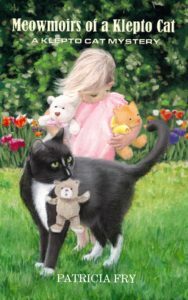 This book and any of the other Klepto Cat Mysteries would make a great Valentine’s Day gift for a special friend, a shut-in, your children’s teacher, your hairdresser, your veterinarian, or anyone who appreciates the world of the cat. 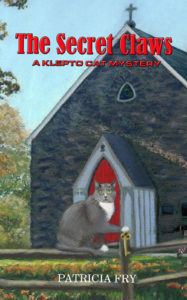 Which of the Klepto Cat Mysteries is most suitable as a Valentine’s Day gift? Let’s see, I love the sweet romance blossoming in Books 1 and 2, Catnapped and Cat-Eye Witness. Meowmoirs of a Klepto Cat is always a great book to start someone off with as it is sort of a collage of the series. Let me know if you give a Klepto Cat Mystery this month and the response of the recipient.